It occurs to me that I’ve been rather neglectful of my blog writing of late. I sometimes get caught up in the ease of just snapping and posting a pic to Instagram and thinking job done. In reality, there’s often much more I want to say about the places I visit that just isn’t feasible on Instagram. Being based in the east end of Glasgow I’ve been guilty of looking towards the West End and the Southside in particular with envy. There’s seems to be such an array of eateries on offer whether it’s breakfast, brunch, lunch or dinner you crave. Then I thought about where I live, and what I have on my doorstep. I realised the envious glances weren’t really necessary. The East End has some amazing eateries itself, so why not highlight them? Why not rave about them? I’ll start where I like most of my days to start, brunch! More accurately, brunch spots because it’s the most important and tasty meal of the day (weekend) if you ask me! Let’s start with the new kid on the block. Scran only opened a couple of weeks ago and is already a huge favourite with me. Owner and chef Chris previously worked in Tibo and Café Strange Brew and is now branching out on his own. I’ve already been twice since it opened and on both occasions the food was excellent. The idea here seems to be to have a simple breakfast/brunch menu and compliment it with specials every now and again. Quality food and excellent value for money. On my first visit, I went for the Stornoway poached eggs and although it may have been lacking in bacon crumb it certainly wasn’t lacking in taste. 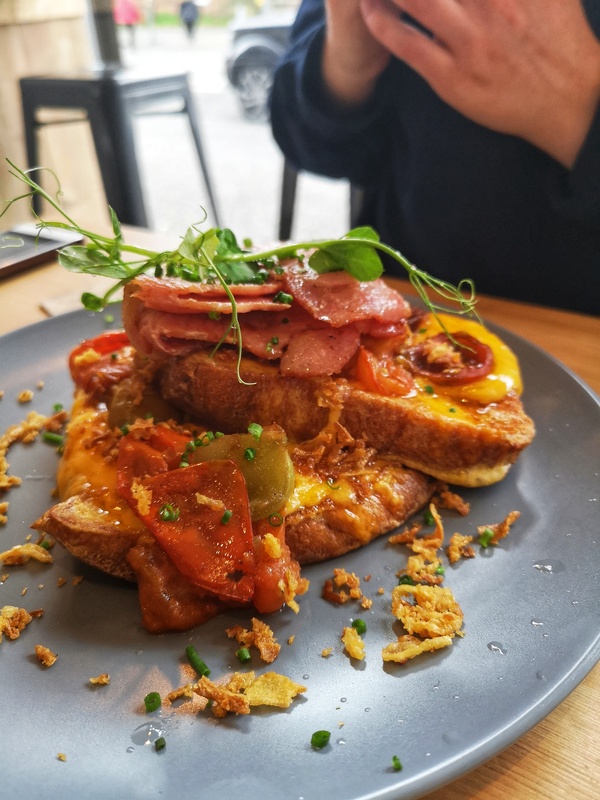 Kirsten had the mature cheddar French toast that went down a treat and I may have stolen a bite or two. They also do Scran fries and we had the crispy halloumi and onion ones with sriracha. 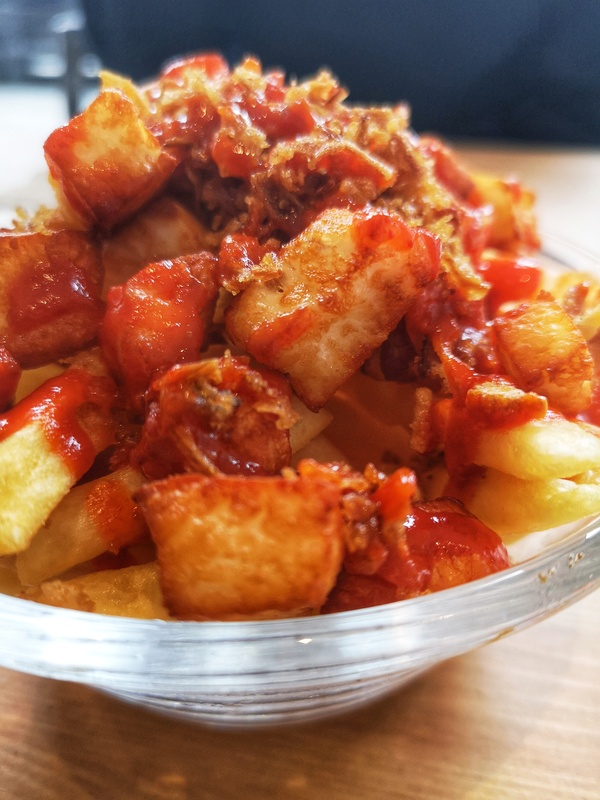 Brunch fries are a thing! Now my second visit, that’s when we tried the first Scran special. If this is an indication of the quality of the specials that’ll be on here then I’ll be back most weekends. I’m not exaggerating when I say the burger meat and pastrami French toast was THEE best French toast I’ve ever eaten! Anywhere! 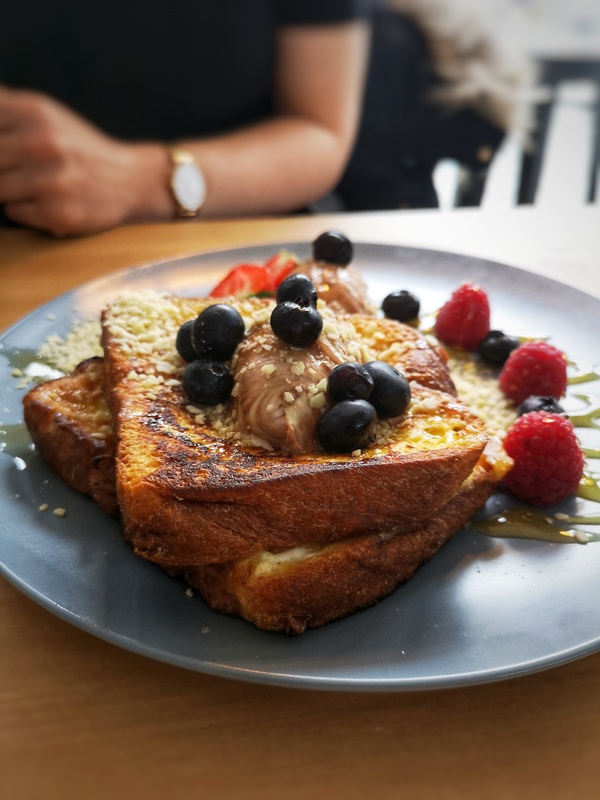 Kirsten had the Nutella and marscapone French toast with berries, which she loved. You may notice a theme here where I love savoury and she loves sweet! 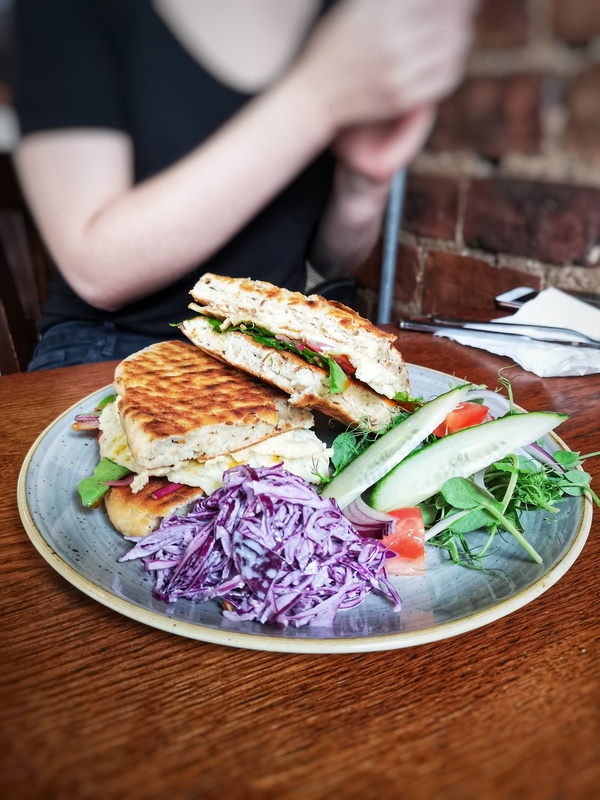 Of the two visits here, we’ve had 4 great dishes and they also stock Big Bear Bakery cakes, who themselves have just opened a permanent place in the Southside. I hear the opening weekend was more than successful! If you haven’t tried Scran yet then I’d add it to your list, make sure it’s near the top! C’est La Vie may not be new to Duke Street but it’s was certainly new on my radar when I visited just before we shot off on holiday at the end of August. It seems there’s a new chef in town and the new menu certainly has some eye catching dishes. 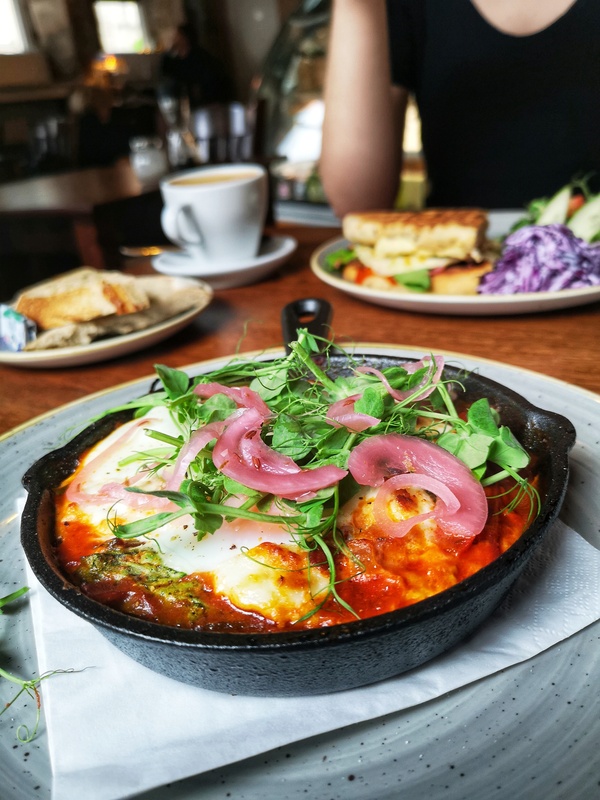 I went for an old favourite of mine when I visited: baked eggs with chorizo and feta. They were out of feta but instead offered to do the dish with whipped goats cheese which was pretty delicious. Kirsten opted for the halloumi flatbread that was pretty tasty (and massive) as well. Since I visited here, I’ve seen several specials that have caught my eye: potato and black pudding hash and courgette and sweetcorn fritters to name but a few. I’ll definitely be heading back here as the food was great and very reasonably priced. If Scran and C’est La Vie are the East End newbies then Tibo is without doubt the OG. When I moved to the East End almost 2 years ago, Tibo was pretty much the only show in town. That wasn’t a bad thing, they do some great food whether it’s 8am or 8PM that you’re feeling peckish. 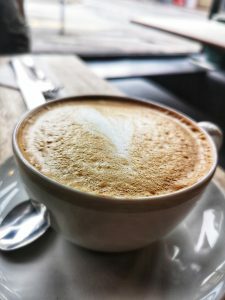 They also do great coffee. Since then we’ve had EAST Coffee Company open up, see below, and the aforementioned newbies above. The brunch scene on Duke Street and the East End in general is only getting stronger which, selfishly, I love. 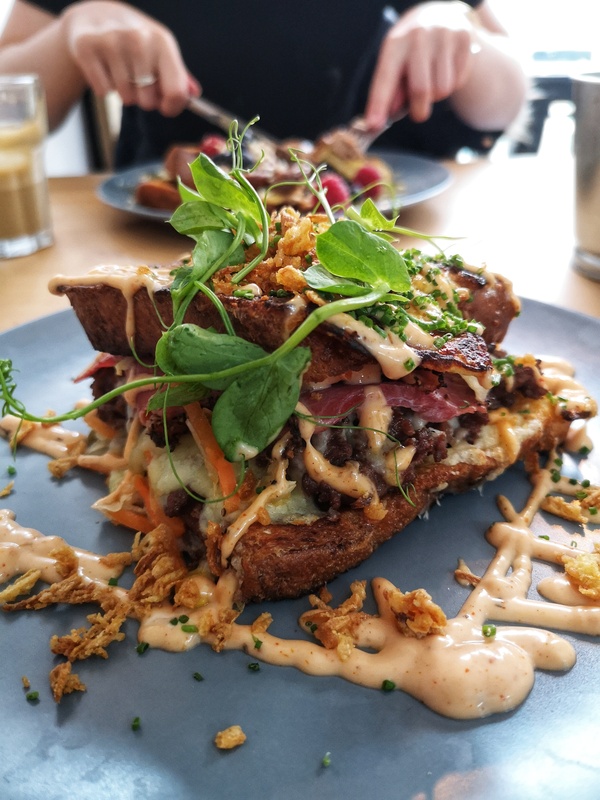 As well as being the OG, Tibo also do one of my favourite brunch dishes: the Stornoway Stack. You’d be excused for thinking this may not be anything special. You’d be wrong though. 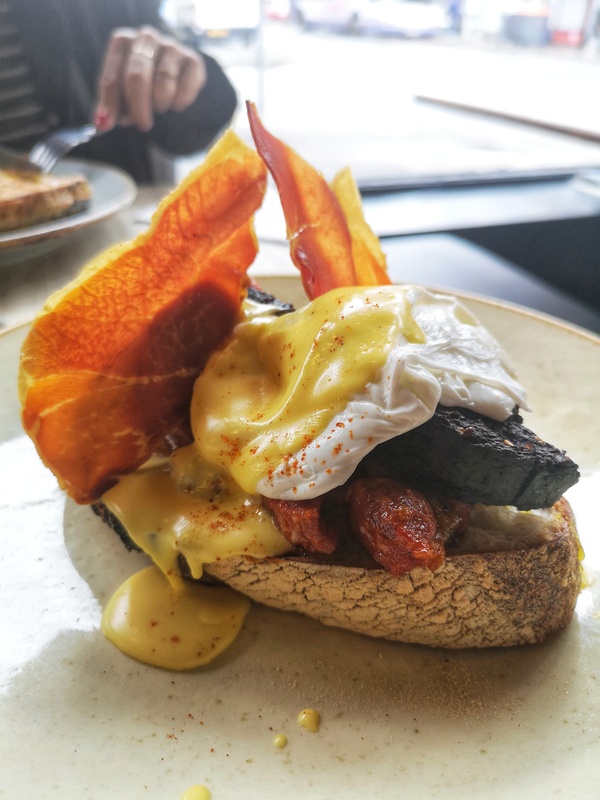 I’m talking sourdough topped with chorizo jam, black pudding, poached eggs, chilli hollandaise and finished with crispy prosciutto. Hats off to the chef for this one. 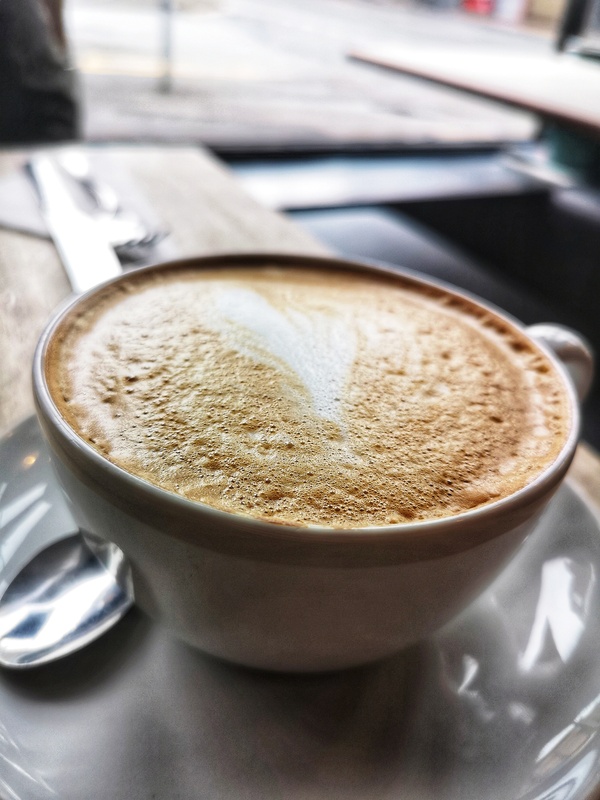 Last but by no means least is East Coffee Company. It’s only down this far as it’s been too long since my last visit. In my opinion these guys probably do the best coffee in the East End. That may not surprise most of you giving their name but the brunch dishes are pretty spot on too! I first visited here just before my birthday earlier this year for a coffee and a cake and both of them were pretty great. 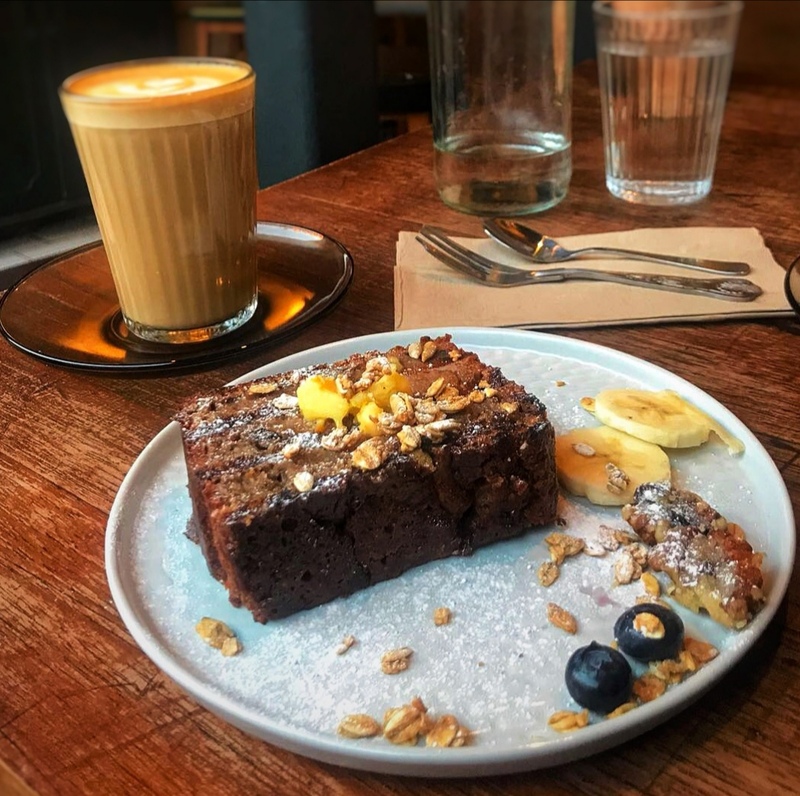 The cake was toasted banana bread which in itself would be great but add to that some orange zest butter, frosted walnuts and fresh berries and you can see why I need to go back. When I went back about a week later I decided to try out their brunch menu. 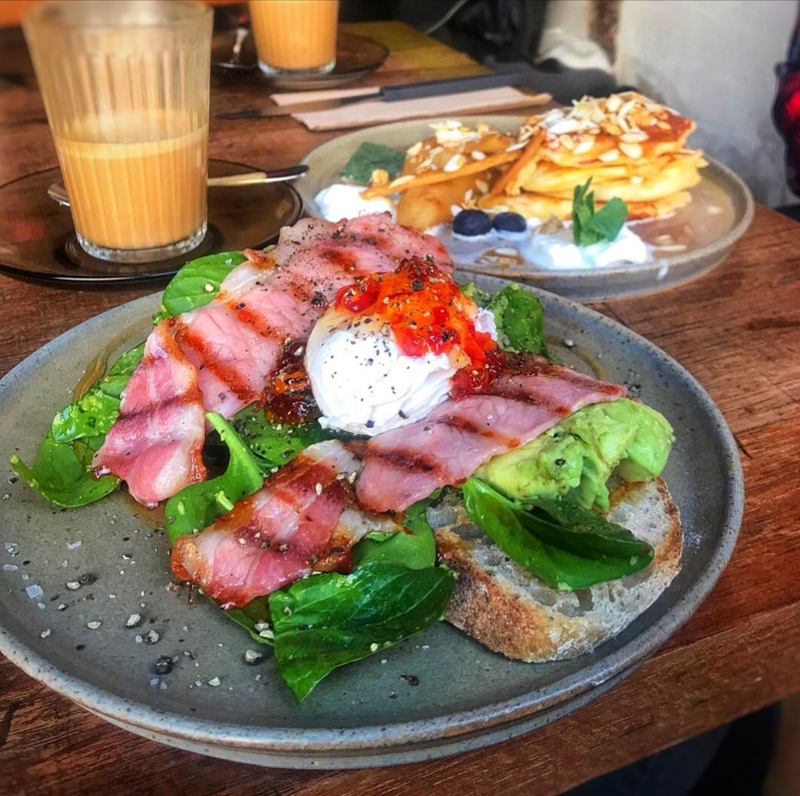 I went for the brekky eggs with avocado, crispy bacon and chilli jam. It was pretty great if memory serves. Those pancakes hiding in the background had poached pear, ginger and cinnamon compote, almonds, vanilla whipped cream and orange zest butter. If you’re drooling right now I don’t blame you. So there you have it! 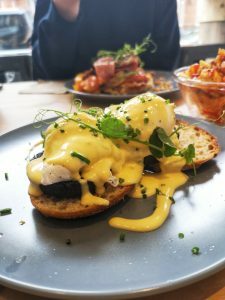 My go to brunch list in the East End of Glasgow. Have I missed anywhere out? 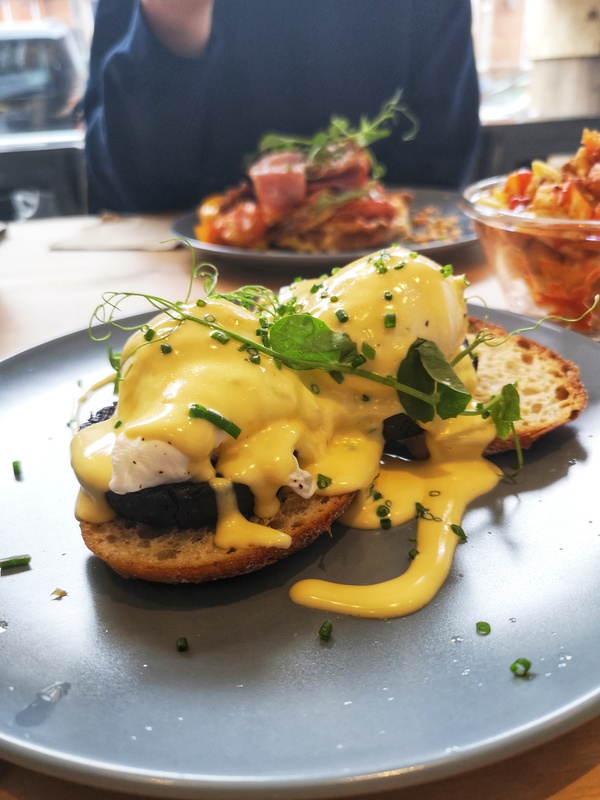 Where’s your favourite brunch spot? Let me know in the comments below.